A La Niña weather pattern could shake up winter forecasts across the country. High snow totals are expected in the Rocky Mountains and across northern states, into the Great Lakes. If temperatures dip a little, as they did last week, the La Niña pattern can mean more snow for folks in the south and northeast as well. Dreams of a white Christmas may come true this year. The National Weather Service is out with its predictions for the beginning of winter (which starts December 21), and its shaping up to be a month of heavy snow around the Great Lakes. The week of December 24 is expected to usher in high winds for the southwestern US and heavy rain across the lower Mississippi Valley and the southeast. We’ve already seen a very snowy fall. Earlier this month, people from Texas to Florida were pummelled with unusual snow totals – spots in the Florida panhandle got up to 2 inches, while Corpus Christi, Texas saw its eighth-snowiest day in recorded history, with a full inch of powder. “Those are areas where we wouldn’t even talk about a snowfall forecast in general, because it’s such a rare event there,”Meteorologist Stephen Baxter, who studies long-term seasonal forecasts at the National Weather Service, told Business Insider. Meanwhile in New York City, seven inches of snow were recorded last week in Central Park. That’s a high total for a place that usually gets an average of 35 inches over an entire year. Baxter said some of the seasonal weirdness can be explained by this year’sLa Niña weather pattern. 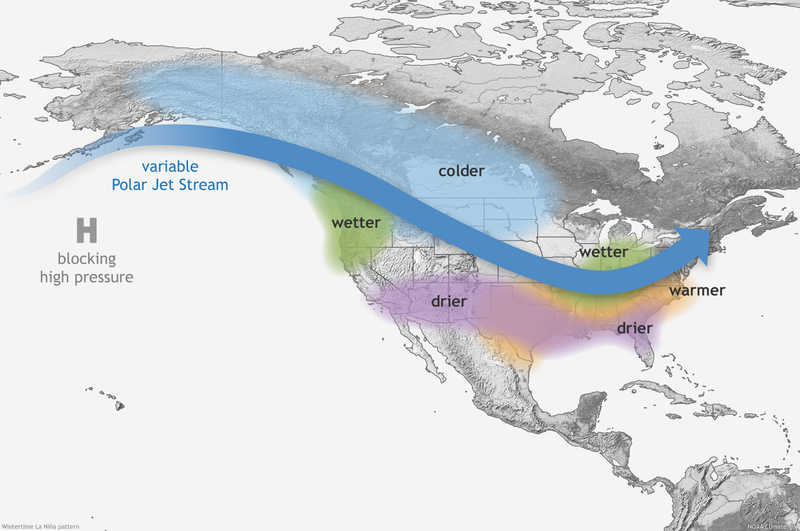 A La Niña wintergenerally ushers in wet, snowy winters for the northern states (especially in the Great Lakes region and the Rocky mountains) and a warm, dry season in the South. But when temperatures dip, as they did last week, that can mean a lot of snow – even in the south. It’s slightly paradoxical: A mild La Nina effect can lead to more snow for everybody. La Nina weather patterns tend to block the west-to-east flow of the jet stream, and more storms gets stuck over the Pacific Ocean. Snowy weather in the Rockies is good news, Baxter said – both for ski resorts and the annual water stores in the mountains of the western US. “We expect a fairly healthy snow pack to develop this year,” he said, a welcome trend for water resource managers. ButLa Niña also means its likely there will be less precipitation in other spots. “That includes parts of Southern California where drought could be exacerbated by dry weather,” Baxter said. That region has already been devastated by a dry, hot summer and a fall full of crippling wildfires. This all comes with the usual caveats, of course: While this winter is projected to be a mild one for much of the country, long-range forcasts are never certain.